Fair. 0547491123 PLEASE READ! This book WILL contain heavy wear, excessive highlighting/writing, loose binding, AND/OR water damage. Supplemental materials such as CDs or access codes may NOT be included regardless of title. Contact us with any questions! Fair. 0547491123 Cover worn but text is still usable. ISBN|0547491123 World History: Patterns of Interaction, Student Edition Survey (C. )2012 (EAM). Fair. Shelf wear. Item is intact, but may show shelf wear. Pages may include notes and highlighting. May or may not include supplemental or companion material. Access codes may or may not work. Connecting readers since 1972. Customer service is our top priority. Very Good. 0547491123 Multiple available! Very minor wear. 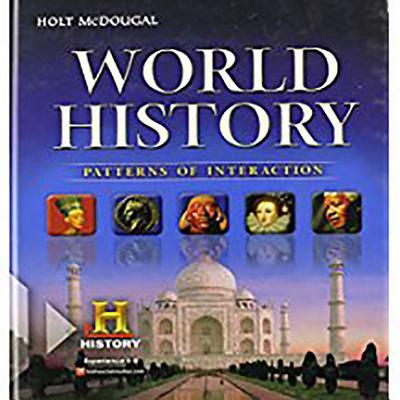 ISBN|0547491123 World History: Patterns of Interaction, Student Edition Survey (C. )2012 (EJ/MRE/EAM) Great buy!